I would love to come home with you and be your companion! Meet Tucker! Tucker is a two year old Airedale Terrier crossed with an Irish Terrier. 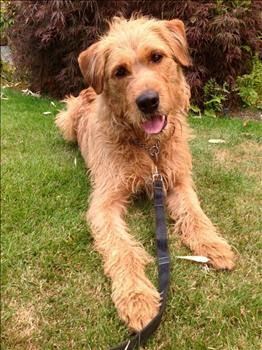 He is a big boy who weighs between 65 and 70 pounds and he has a gorgeous red coat reminiscent of the Irish Terrier. 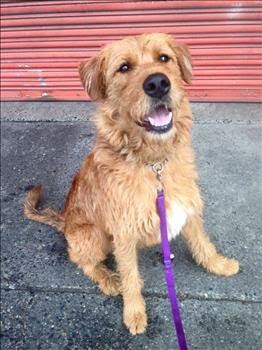 This engaging fellow is located in Victoria, BC, and is currently in the care of the Victoria Branch of the SPCA. AireCanada is impressed with the amount of training the SPCA staff has given Tucker during his 6 month stay with this agency. Tucker arrived at the shelter very undersocialized and actively “tasting” the world around him. He is not an inherently aggressive dog but merely a foolish Terrier puppy who needs a firm but loving hand. He has learned hand commands and is easily distracted from poorly chosen behaviors when his handler offers food. Our local AireCanada volunteer visited Tucker and took him for a walk. Due to his tendency to mouth, Tucker has been taught to wear a muzzle when he is out and about in public. Despite being a very strong dog, he walked nicely with our volunteer and played gently with a chance-met puppy. He reacted well to positive reinforcement. He ignored some birds that were encountered during the outing completely! Our volunteer deemed him to be a nice boy with lots of potential. If you adopt me, I promise to work hard to learn how to be the dog you want to have in your life forever! Tucker requires a Terrier-experienced home — someone who understands the Terrier temperament and who is willing to continue his training and to work to extinguish his puppy mouthing tendencies. Because of his size and enthusiastic demeanor, Tucker is not a suitable dog to live with young children. It is our impression that Tucker could be an absolutely amazing companion for an active individual — someone who enjoys hiking, running or being involved in outdoor activities. This is a courtesy listing by AireCanada on behalf of the Victoria SPCA. Please contact Annie Bell at the Victoria SPCA at 250-388-7722 if you are interested in adopting Tucker or learning more about him. 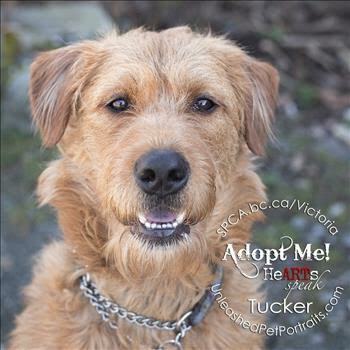 The AireCanada Airedale Rescue Network is willing to support Tucker’s adoption with advice regarding care and training. Tucker is begging for you to offer him a new home. How can you resist that face?